At its time Rome was the largest and most important city in the world. Products from all corners of the Roman Empire and beyond were brought into the city on a daily basis. Much of it came to Rome by sea since shipping was at the safest and most effective way of transporting goods and merchandise at the time. As Rome itself doesn’t lie on the sea, the port city of Ostia was built at the estuary of the Tiber. In ancient times it served as a seaport and trading centre for the city of millions. At its heyday in the 2nd Century AD, Ostia had up to 50,000 inhabitants. Later after the down fall of the Roman Empire, Ostia – like many other Roman cities fell into disrepair. The stones of its buildings were used for other buildings, and the port silted up over time. For example the Leaning Tower of Pisa was constructed with stones that came from Ostia. Ostia was already built in the 3rd Century BC as a military base, alongside the temples of Jupiter, Juno and Minerva. Under the reign of Emperor Claudius the actual port was built in a hexagonal shape. Ostia had all of the qualities which even today are characteristic of a seaport- a lighthouse, shipping agencies, fire department, police, guest houses and even a mint. Right in the sweltering heat of summertime it is a good idea to take a look around Ostia. There you can escape the stress of the city and the tourist crowds, as this attraction is less well known and not as crowded as the ‘real’ Rome with its world famous attractions. In addition, the ancient seaport is in a good condition and the entire site can be explored on your own in all manner of peace as there are no prescribed routes and locations for tourists. Furthermore during hot weather the Lido di Ostia beach – approximately 5km away attracts people for swimming in the Mediterranean. Ostia is open to the public from Tuesday – Sunday from 8:30am to approximately 1 hour before sunset. One can reach Ostia Antica via the metro using line ‘B’- station ‘Ostiense’. 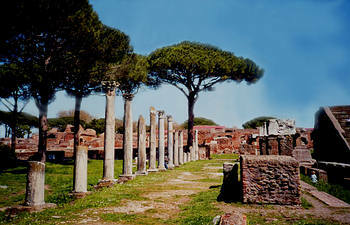 Here one alights and then takes the tram to the stop ‘Ostia Antica’. One can access the beach by staying on the tram; the last stop is the Lido Cristofo Colombo.